Jason is a funny guy and this is a funny book–from a WSJ sports writer! Go figure. 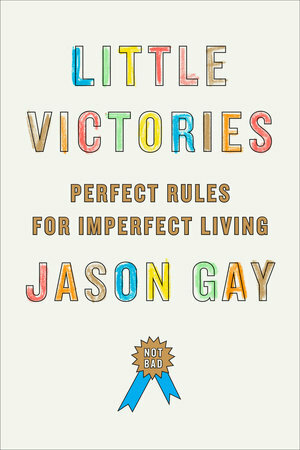 In Little Victories, Jason, a fortyish, regular guy reflects on his life in a collection of essays on different mundane topics. There’s no venom here, or slapstick—it’s all Seinfeld-like humor about everyday stuff like being cool (or not), office heaven and hells, gyms and, my favorite, music for weddings. Yes! Music for weddings (or any event where you want people to tear up the dance floor. Just THINKING of The Commodores’ Brick House makes me wanna move–er, groove.) This book is a total delight. And a reminder of how incredibly wonderful life is when we stop to notice the silliness all around us. Pick this one up after a cruddy day. Guaranteed to bring smiles.